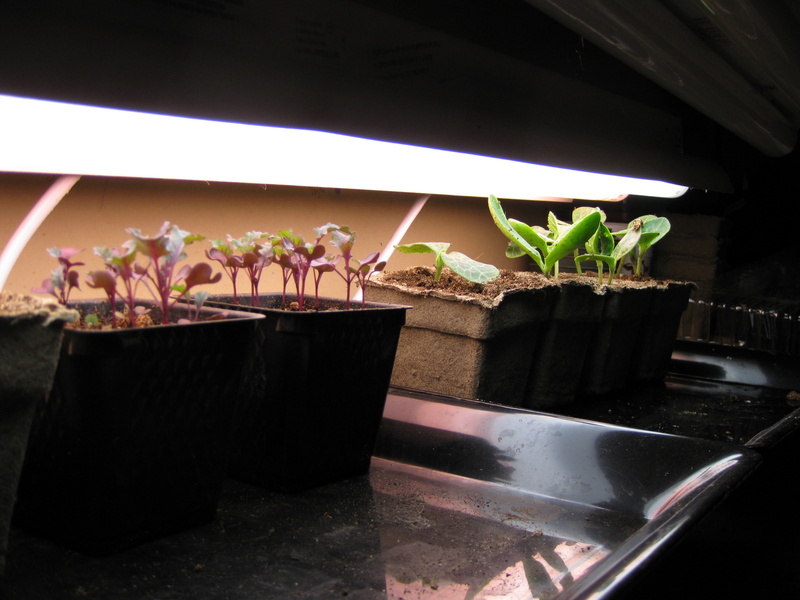 First, many of my veggies get started in the basement under the grow light. Here are some kale and squash seedlings. Starting seeds indoors takes a bit of electricity, but helps delicate seedlings establish themselves, helps your garden get started earlier in the season, and gives the veggies currently in the garden a few more weeks to grow before they are replaced by new transplants. Seeding indoors is a great garden time and space saver. 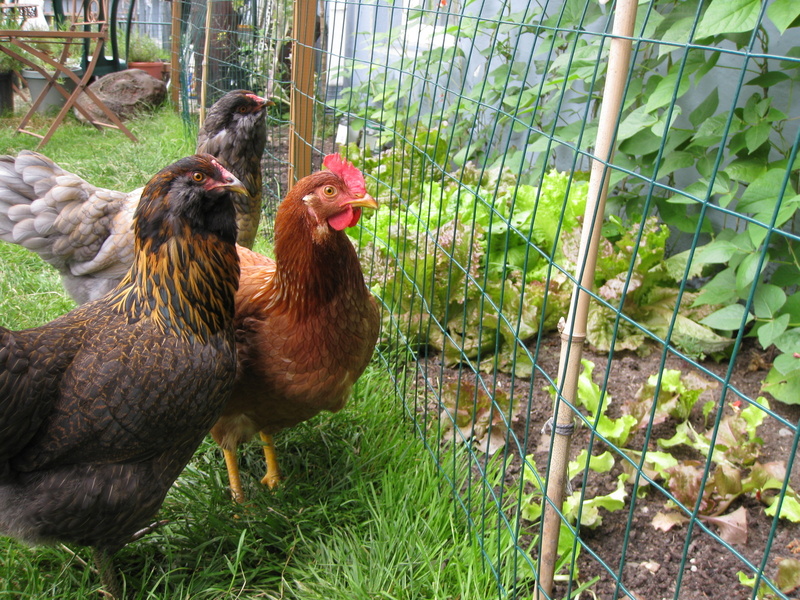 Our original garden consists of three 4×8′ raised beds and one 2×12′ strip along the fence in the corner of the lawn. This spring we have peas along the fence, beets and chard in one raised bed, brassicas in the second, and peppers and basil in the third. 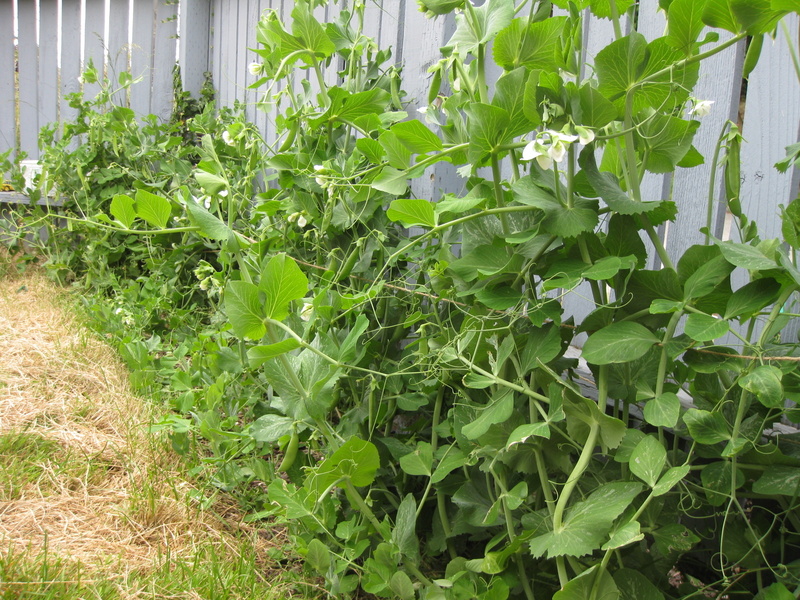 The peas (Cascadia snap peas from Territorial) are still pumping out delicious pods; hopefully i won’t have to cut them off early when it comes time to replace them with fall broccoli and cabbage transplants mid-August. In bed one, i made the mistake of not replacing the over-wintered swiss chard plants with new transplants as soon as it was warm enough. We harvested from the plants all through last fall and winter, and they did continue to produce this spring, but bolted soon after the weather warmed up. I cut as much as i could before the plants could flower and their leaves turn bitter, and shared it with several neighbors. But then i had no transplants to replace them with! Now, in July, the new plants are finally big enough to take leaves from. Whoops. Lesson learned. In bed two, I transplanted two successions of broccoli and cabbage seedlings: the first has been eaten (by us or the chickens, depending on the amount of slug damage), and the second is taking too long. 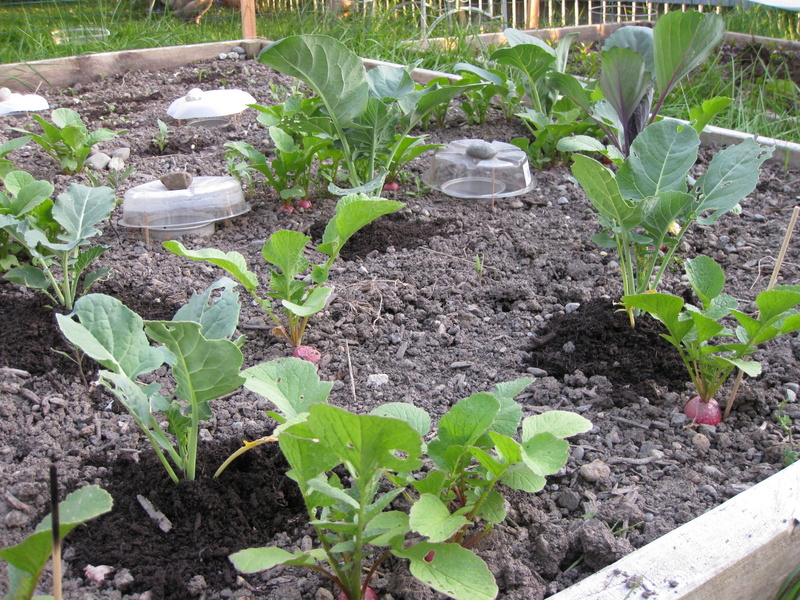 Early in the season, i sowed radishes between the bigger broccoli and cabbage plants (as per Steve Solomon) because they are so quick to mature they don’t bother their slow growing neighbors. Now it is time to replant this bed with rutabaga and parsnip… which i again seeded between the rows of nearly mature broccoli, hoping that the timing will work out. One thing i am learning in this garden is patience and slow-down-itute. Cramming too much into the garden plan results in disappointment. Into bed three went my home-grown pepper seedlings, two extra tomato seedlings that i couldn’t bring myself to toss out, and several basil plants from the Seattle Tilth plant sale. 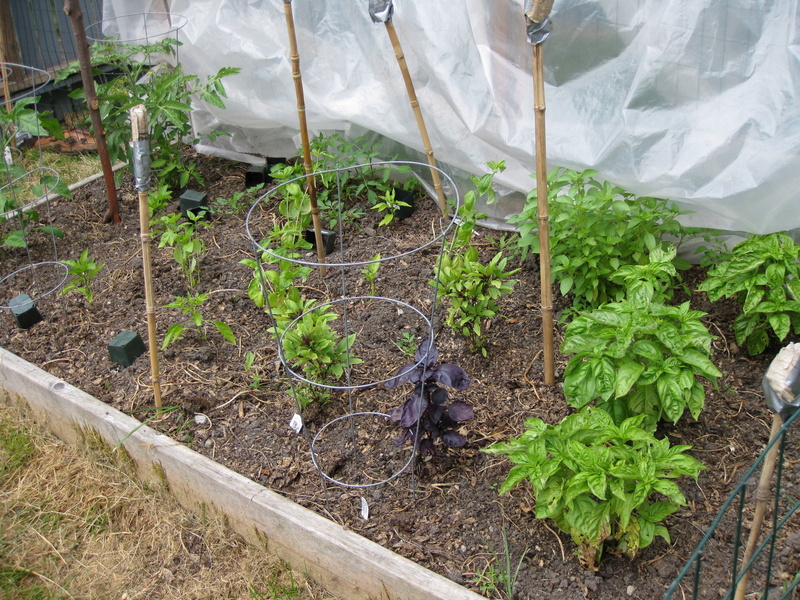 This bed was covered with a plastic cloche to keep it warm, but several hot days- and me forgetting to open the ends of the cloche- fried the peppers. I feel i have failed David, the main eater of hot peppers, but next year i’ll get those whiny little biatches to perform by starting them earlier and protecting them with wall-o-waters when they are first transplanted. This year i have all but given up on them and have filled the spaces in between with more basil seedlings from the apocalypse room. When we first moved in, there were two flower beds along the west side of the house growing ginormous irises. Those promptly became veggie garden space as well. The smaller patch is growing kale this year, which will mostly be split between our housemate Kate and the chickens, both of whom love kale more than life itself. 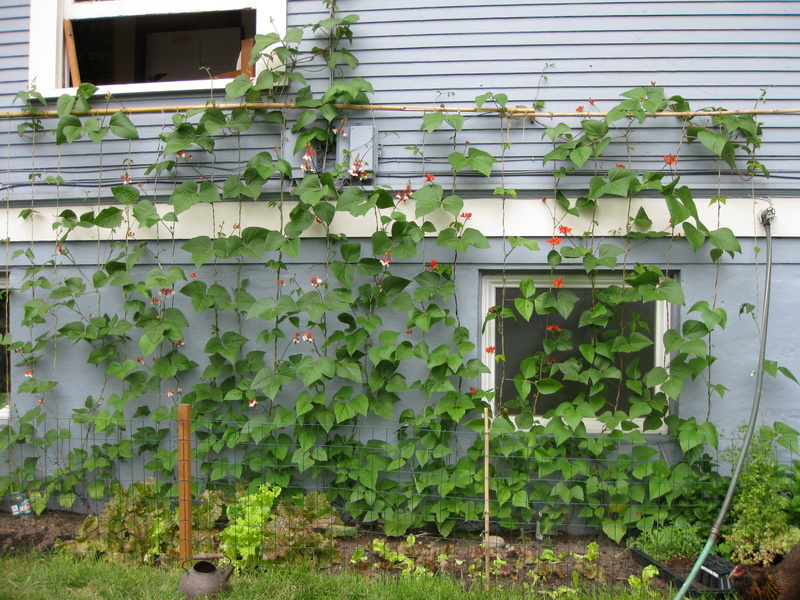 In the larger bed, i’ve grown runner beans along the house for the last two years. If you have never had runner beans, you MUST. GROW. RUNNER BEANS! They are the most amazing thing ever- huge pods that are slightly fuzzy and oh-so-beany. They don’t get tough and stringy as they get even more huge. The vines can grow to 10 feet tall and have beautious cascades of red flowers. If you try them, you will never grow bush beans again. The rest of this bed is growing successions of lettuce and spinach, and we have a mojito patch under the hose faucet, because that’s where mint likes to grow. 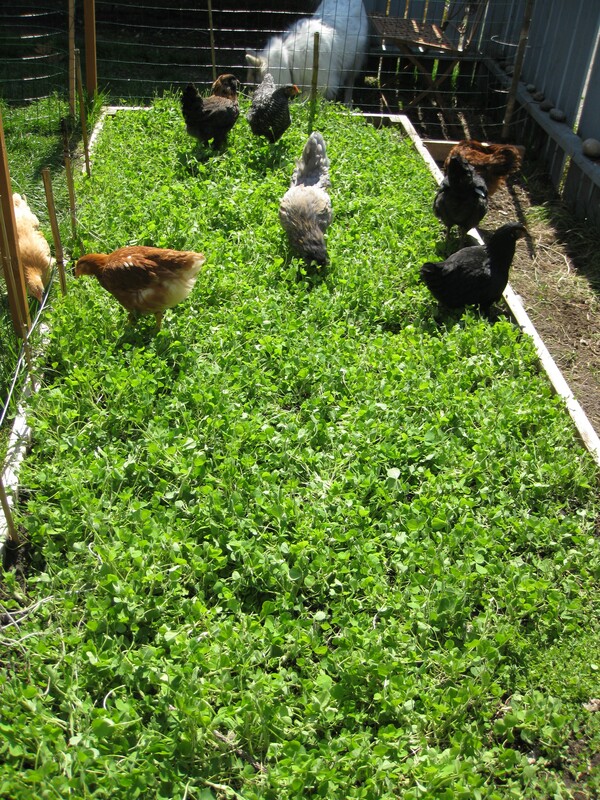 One afternoon last spring i tore out a 4×12″ patch of grass to make another garden bed, much to David’s surprise. I just couldn’t help myself! Or as Daniel would say, “No one was there to stop me!” Into that bed went squash, followed by crimson clover over the winter, which was eaten by the chickens this spring. Now the bed is a teeming mass of tomato vines. 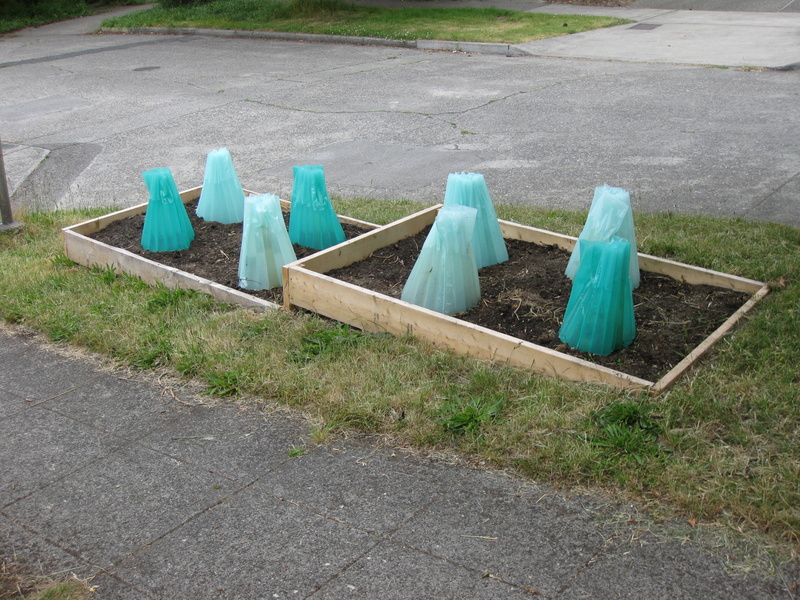 Intent on getting a boat-load of tomatoes this year, i started the transplants out in wall-o-waters (some home grown and some from the Seattle Tilth plant sale), and then when the plants were too big, covered the bed with a plastic cloche that was open at both ends. 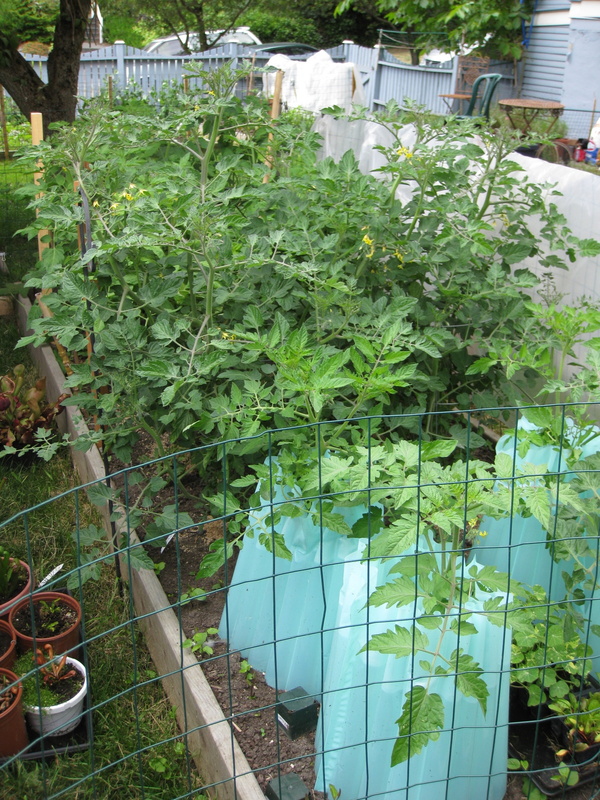 The plants did not fry and the air was still warm enough under the tunnel to grow huge tomato plants. Now i just need to fertilize them with some phosphorous to get them a-fruiting. (Nitrogen fertilizer induces leafy growth; phosphorous fertilizer encourages fruit setting.) We had one ripe tomato already- a good sized Oregon Spring. We gave it to our neighbor Becky, as per the Murray-Munger tradition of racing your neighbors to produce the first ripe tomato and then giving it away. This year we built one more 4×12′ bed out in the parking strip (gawd that’s crappy soil) and filled it with 8 zucchini, yellow squash, and green and lemon cucumber plants. I started the seeds indoors in cow pots and protected the transplants with the wall-o-waters that had just come off the tomatoes. I think we could start the plants a little earlier next year- some of our neighbors have giant squash plants already, and ours are kind of puny… but they have little baby squashlets on them! And that’s what we’ve got in the garden this spring and summer. Fall/cover crop update to come soon.